The first residential high-rise to be built on the Gold Coast in two years will replace an old Red Rooster restaurant at Surfers Paradise. Marketing agent Deborah Provost and Peter Bell of Brookfield Multiplex. Singapore developer Ho Bee Land this week announced it had contracted construction company Brookfield Multiplex to build the $120 million, 41-storey tower. The site, on the corner of Main Beach Parade and Surfers Paradise Boulevard, was previously home to a Red Rooster franchise that was a feature on the Gold Coast 600 street circuit. 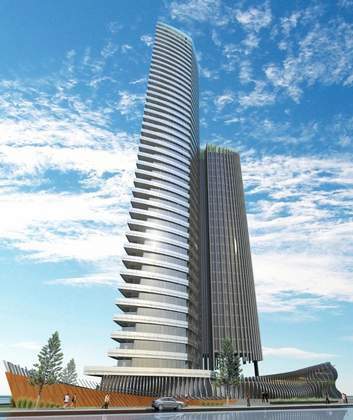 An artist impression of the Ho Bee Land Australia tower at Surfers Paradise. The as-yet-unnamed building will feature a unique leaf-shaped design, incorporating 223 residential units, roof-top garden, gym and ground-floor retail space. Earthworks have already begun on the high-rise, with construction due to finish in late 2015. 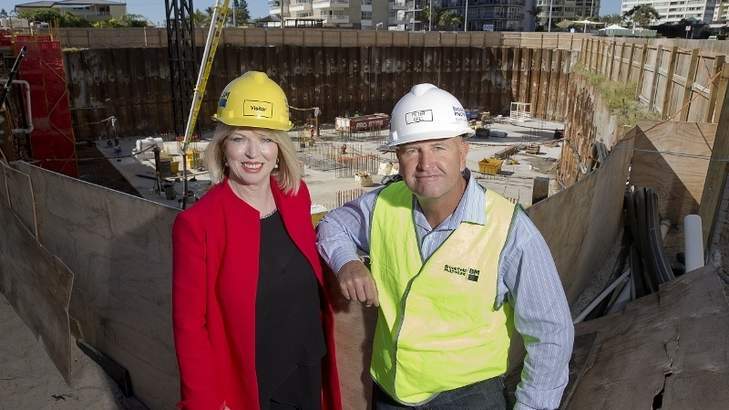 The construction is expected to generate 500 jobs for the recovering Gold Coast property sector, Brookfield Multiplex regional managing director Rod McDonald said. “Queensland’s residential market is gaining pace and it’s fantastic to be back on the Gold Coast and delivering this project which will see cranes returned to the Surfers Paradise skyline for the first time in two years,” he said. Brookfield Multiplex has constructed some of the Gold Coast’s most significant developments of recent years, including the Hilton Surfers Paradise, the Wave at Broadbeach, the Gold Coast Convention and Exhibition Centre and Pivotal Point Tower at Southport. Already on the company’s workbook are the new state government headquarters in Brisbane’s CBD at 1 William Street and the $325 million Indooroopilly Shopping Centre redevelopment.